A LUXURY HOMEOWNER’S GUIDE www.SeeWhatSoldYesterday.com THE LUXURY PANEL: What makes San Diego a great place to buy luxury real estate? Sothebyâ&#x20AC;&#x2122;s International RealtyÂ® is a registered trademark licensed to Sothebyâ&#x20AC;&#x2122;s International Realty Affiliates LLC. Each Office Is Independently Owned and Operated. DRE #01767484. Sotheby’s International Realty® is a registered trademark licensed to Sotheby’s International Realty Affiliates LLC. Each Office Is Independently Owned and Operated. DRE #01767484. THE LUXURY PANEL: What makes San Diego a great place to buy luxury real estate? 30 THE LUXURY PANEL Why is San Diego a great place to buy luxury real estate? September’sluxurypanel The Luxury Panel is a rotating group of San Diego’s top Real Estate professionals who specialize in the luxury market sharing their expertise on hot topics and home buyer & seller questions. San Diego ranked #5 in Lending Tree’s study of cities with the highest share of million-dollar homes. Why is San Diego consistently a great place to buy luxury real estate? Sales numbers below reflect total number of listed homes sold between 7/16/2018 and 8/15/2018 in these luxury communities with featured homes sold by San Diego’s Top Producing Agents. 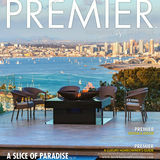 Visit www.SanDiegoPremier.net for full property lists by community. Exclusive house dealer for Paul Robert, Henredon, Drexel Heritage, A.R.T Furniture, and Wesley Hall in San Diego. Also featuring Elegant Lightning, Jonathan Charles, Maitland Smith, John Richard, Theodore Alexander and more. PRESENT THIS AD FOR ADDITIONAL DISCOUNTS! Barry Estates The Wall Street Journal recently released the list of the 2017 Top Producing Real Estate Agents in the Nation, and Laura Barry is ranked #1 in sales volume in San Diego County and #54 nationally. Laura has consistently been ranked in the top 55 of the Wall Street Journal’s list for years 2006 through 2017. In 1999, Laura was the first Realtor in San Diego County to ever sell over $100 million in sales volume and over the last decade Laura has closed transactions in excess of $1 billion. is a monthly publication. All rights reserved ©2018 by San Diego Platinum Publishing, LLC. 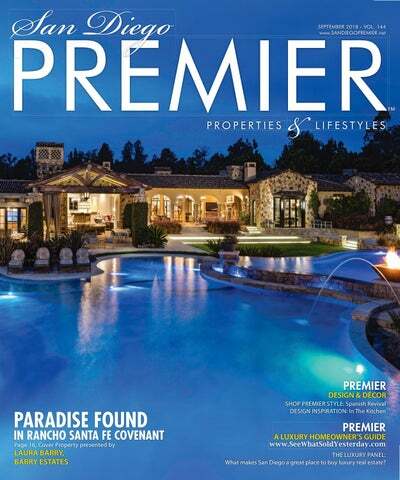 All information and photography inside this publication deemed reliable but are not guaranteed by San Diego PREMIER Properties & Lifestyles. All real estate advertisement herein are subject to the Federal Fair Housing Act and Equal Housing Opportunities Act. While this oceanfront estate has breathtaking Pacific Ocean views, it also has an open ﬂoor plan to maximize your coastal experience. This indoor family room can instantly become an outdoor oasis too. FIT FOR ROYALTY There were so many extraordinary photos of this French inspired Chateau Compound that I couldn’t pick just one or two to feature, there were literally 8 photos I kept staring at. No short cuts were taken here, the grand scale living in this estate is meant for royalty. This is an extremely gorgeous center courtyard entrance looking from the inside out. Upon walking through those double wood doors, your guest will feel like they just entered a secluded retreat in the Mediterranean. Designing a sophisticated formal room that opens to a casual outdoor space can feel tricky. Do not fret. Behold the perfect balance of traditional elegance and tropical oasis in Rancho Santa Fe. By incorporating greens and pinks from the outdoors in the rooms beautiful rug, and throwing in a few organic prints, the transition is both seamless & timeless. IS THAT AN ITALIAN IN THE KITCHEN When it comes to lux cooking, Italian made ILVE is at the top of the list. Their Majestic line comes in seven standard and over 200 custom colors and looks as good as it functions. We spotted this handsome Italian in a French inspired Villa in The Heritage. BE UNIQUE When it comes to luxury, one-of-a-kind is one of the best ways to stand out. In this La Jolla home an expansive window at the bar area oﬀers an underwater view of the swimming pool which immediately lets you know this is something exceptional. Not only was Lilian Rice the lead planner & visionary behind our beloved Rancho Santa Fe, she was one of the first women to earn a degree in architecture from UC Berkeley. Can we just say…Girl Power. It is always special to discover a Rice original, like this beauty, on the market for the first time in almost a century. This cannot be underestimated. The ﬁrst impression is the most important. If you can invest in one thing when putting your home on the market this is it. Pulling up to this La Costa Greens home you immediately notice the impeccable landscaping, fountain, lighting and beautifully maintained exterior. by using low and ultra-high frequency sensors to then detect activity outside of this normal range. It can sense and alert the homeowner to events such as slow water leaks and termite activity in the walls. This technology can potentially mitigate expensive damage to the home. One highest priority for consumers is a solution that provides the largest ecosystem to work across platforms and products, thus simplifying the end user’s experience. While there are many options in products “Alexa, Amazon Echo, Apple HomeKit,” there is little interconnection between devices with their own platforms. The industry is well-aware of the complaints and we should expect to see many new products available that aim to reduce the frustration of the home owner. The rapid evolution of Home Automation technology is creating ease of homeownership, especially for those with second and third homes. More and more, homes with these “Smart Systems” in place will be more than just a cool feature but an expectation for potential buyers. *This Cielo Estate is offered by Kerri Klein & Alana Ziman, Klein Real Estate, 858.692.3983, 619.508.1677 DRE#01856679, 01981760. See page 125 for more. *This Coronado Home is offered by Scott Aurich, Pacific Sotheby’s International Realty, 619.987.9797 DRE#00978974. See page 48 for more. PREMIER agents share living rooms that they love. *The Fairbanks Ranch Estate is offered by Lucy Kelts, Berkshire Hathaway Home Services, 858.756.0593 DRE#00929005. See page 85 for more on this home. These spaces were meticulously cultivated with wine connoisseurs in mind. Now the diďŹ&#x192;cult part is deciding which bottle to enjoy! Highly Productive With school back in session productivity will shift into overdrive and these home oďŹ&#x192;ces make it easy to get into the zone. Based on MLS data from these zip codes, 92067,92091,92014,92037,92130,92118,92024,92127,92128, 92008,92009,92010,92011,9075,92064,92101 for the period of 1/1/2014 - 8/15/2018. **Median Price Single Family Detached Homes, March 2018 via Multiple Listing Service of Sandicor, Inc. Greater San Diego Association of REALTORSÂŽ.Data represents the activity of various brokers. Data does not represent the sale activity of non-listed properties. The data might not be completely accurate. Source: Michael Taylor does notrepresent, nor warrant, the accuracy of this data. If you have any questions regarding the above information or any real estate matters, please do not hesitate to call. Information subject to change. A Jewel in the Crown – one block to the beach. Stunning architectural design w/an elevator to all 3 levels. Sun deck w/ﬁreplace and sweeping views from the ocean to downtown. 6BD, 4.5BA 5,000 SF. Premier Location, near the beach & the Del! Private, island home lushly landscaped w/ water feature and outdoor ﬁreplace. Roof deck to relax & enjoy the ocean & sunset views! 5BR, 4.5BA 4,843 SF. Coronado Cool. Brand New, near the beach, light and bright indoor ﬂowing to outdoor living spaces. Large covered patio in the private yard. Roof deck w/ocean views. 3BD, 3.5BA 2,894 SF. Luxury single level home with center courtyard open kitchen design, master bedroom retreat and separate 1BD/1BA casita. Outdoor cooking station and plunge pool. 4BR, 3.5BA 3,604 SF. Brand New, contemporary design with open ﬂoor plan, covered front patio, roof deck and game room in the basement. Back yard with Covered patio w/ﬁreplace, lawn and 2 car garage. 5BR, 4.5BA 3,200 SF. Historically Designated, 1909 home in the heart of the Village. Extremely well cared for with immaculate wood ﬂoors, elegant ﬂoor plan, extra large yard. Excellent location near the shops, dining and Hotel Del. 4BR, 3.5BA 2,300 SF home, 7,700 SF Lot. Overlooking the crystal blue Coronado Coastline. Located on the 4th ﬂoor, in the largest ﬂoor plan in the Shores. Finely designed, incredible quality and ﬁnishes throughout. 3BR, 3.5BA 3,250 SF. New construction – Spring 2019. Coronado dream home across from the golf course with open design, master bedroom retreat and roof deck. Backyard w/lap pool and casita. 6BD, 6BA 5,000 SF. Island Hacienda! Charming front entry, open design and room for guests to stay. Private courtyard w/ﬁreplace, sparkling pool & spa. Surrounded by lush landscaping. 5BD, 3.5BA 3,500 SF. Coastal contemporary in the center of the Village. Overlooking the park w/large front porch, gourmet kitchen, master bedroom retreat and 3rd level deck with outdoor ﬁreplace. 5BR, 7BA 3,663 SF. Bay and Skyline Views! Luxury condo in The Landing facing the bay with 150 SF covered balcony to enjoy the views. Updated, 2 ﬁreplaces, 2 parking spaces and storage unit. 2BD, 2.5BA 2,229 SF. Brand New! On trend design with inviting indoor outdoor living spaces. 4 BR suites and roof deck with panoramic views. Excellent location near the schools, parks and shops. 4BR, 4.5BA 2,344 SF. info@barryestates.com www.CatherineandJasonBarry.com 858.756.4024 Call for information on Catherine & Jason’s other active listings as well as exclusive listings not yet on the market. rancho santa fe covenant california A LUSH OASIS IN THE RSF COVENANT! rancho santa fe california FAIRBANKS RANCH: A HOME FOR ENTERTAINING! rancho santa fe covenant california WOW, WHAT A VIEW! Brand new construction located on one of the quaint and highly sought after, Covenant cul-de-sac streets in Rancho Santa Fe. With a more traditional exterior and a transitional/modern interior, this two story home features approximately 5,558 square feet of living space encompassing a great sense of scale, style and natural light. The first level of living includes an extraordinary chefâ&#x20AC;&#x2122;s open concept kitchen including top-of-the-line appliances and an informal dining bar which flows into the great room with fireplace and walls of glass with accordion doors that open to a patio. The patio is flanked with a full service summer kitchen and dining bar for an indoor-outdoor flow and prime for entertaining. The backyard is private with a covered lounging/dining area, and a firepit for relaxing and enjoying the Southern California evenings. The property is ideally located within walking distance or a golf cart drive to the exclusive Rancho Santa Fe Golf and Tennis Clubs, Roger Rowe School, and the Village. Rarely does such a special property become available in the exclusive guard gated community of Fairbanks Ranch in Rancho Santa Fe. This significant, one-of-a-kind, 17,515-square-foot-estate compound with breathtaking 270-degree panoramic ocean, mountain, and golf course views is perched on one of the highest locations encompassing 3.39 acres. Design details begin with the decorative entry gates that open to the winding driveway flanked with tropical landscape to the entry porte-cochère and oversized glass and metal front doors. The impressive home boasts a stately and very livable 3 level floor plan showcasing a grand foyer, formal living room with fireplace, entertaining bar, oversized formal dining room, library, kitchen with open family room and 8 ensuite bedrooms with multiple walk-out terraces and balconies through-out. Sparkling with character, charm, and style this English Country Tudor is elegantly positioned on a private 2.54 view acre lot within the exclusive guard-gated community of Fairbanks Ranch in Rancho Santa Fe. Upon arrival you are greeted by stately mature trees and foliage and a soothing water fall feature. Heartwarming interiors offer handcrafted traditional wood and brick work, including the formal living and dining rooms, wood flanked library with fireplace and double height ceiling and chef’s kitchen with informal dining that opens to the family room with an elaborate tudor brick fireplace. The backyard is a nature lovers paradise with a lagoon pool with spa, outdoor summer kitchen and beautiful stately trees overlooking the San Dieguito River Valley. A welcoming entry courtyard leads you to this almost new, designer owned, single story, easy living “Modern Farmhouse” located in the desirable gated community of The Bridges in Rancho Santa Fe. Doors disappear allowing the indoors and outdoors to become one with a trio of entertainment areas. Three large bedroom suites, spacious formal living room with fireplace, oversized dining room with stone fireplace, office, and kitchen that opens to the great room…. The perfect flowing floorplan for today’s living, intimate gatherings or for entertaining in style. One can enjoy the outdoors with the sparkling pool with spa, outdoor fireplace that is wood burning and numerous charming courtyards. Refreshing secluded retreat links the indoor and outdoor for a beautiful balance of informal elegance that is warm and inviting. This 4 bedroom (with optional 5th), 5 bath custom home with center courtyard with ﬁreplace and prominent fountain inspires tranquility. Enjoy the privacy of the backyard with dedicated dining and lounging areas, disappearing edge pool, spa and outdoor shower. Amazing views of the coastal foothills and the 15th Fairway at the par 71 Bridges course – a space to create special memories awaits. Rancho Santa Fe | 6941 Corte Spagna | $1,949,000 | 3BD/3½BA Gorgeous single level Villa with privacy and comfort and extended casita. Perched on a picturesque knoll on the north side on 1.42 verdant acres, a short walk to the community lake & tennis courts, this 6+ bedroom estate with a main ﬂoor master suite, paneled study, theater room, and a secondary family room up plus a full separate guest house is a rare ﬁne! The charming entry courtyard with fountain leads to the entry doors which open onto the formal entry with views through the living room to the artistic waterfall pool beyond. The expansive grounds with colorful planters, sprawling play area & serene park-like views. Nothing can compare to this priceless estate in this ﬁnest gate guarded community. 6155 Avenida Cuatro Vientos | Rancho Santa Fe Offered at $4,695,000 Completely & extensively remodeled with the ﬁnest materials, this exceptional estate exudes a serene resort ambiance. Sited on 2.52 view acres on the north side of Fairbanks, with walking distance to community lake. The exquisite main house consists of 5 BR plus main oﬃce as well as the formal living room, massive family room, media room, extraordinary gourmet kitchen with: Subzero refrigerator & freezer, 2 dishwashers, Wolf range plus 3 en-suite bedrooms and 2 powder rooms. Upstairs is a sumptuous master suite with ladies oﬃce, incredible lavish bath and view balcony, plus an en-suite BR & formal oﬃce. The grounds contain a full 2 BR guest house, north/south tennis court, sparkling pool, spa, lawn play area, 4 car garage, and many outdoor entertainment areas. Coronado | 825 Margarita Avenue | $4,200,000 | 5BD/5½BA Sophisticated blend of coastal and farmhouse influences designed by Christian Rice. Coronado | 618 A Avenue | $5,100,000 | 3BD +2BDGuest Apt./3BA Stunning estate in the heart of Coronado Village. Indoor/outdoor living from every room. Coronado | 910 Glorietta Blvd. | $6,650,000 | 5BD/5½BA Beautiful home with wiews of the Golf Course & Glorietta Bay on 12,000+ sq ft lot. Only 3 blocks to the ocean. Wonderful 2-story home on a large lot, with ocean and sunset views. 5 bedrooms/3 baths. Lush front and back yard with mature landscaping. 2-car garage. Walk to school, shops and restaurants. Stunning rotunda entrance accented by inlaid wood flooring. Concave walls of glass seamlessly merge interior rooms to outdoor spaces and to the view beyond. The disappearing edge pool, an all-encompassing bar-b-que/cooking and entertainment area typifies resort living at its best. Impressive wood paneled library, plus an outstanding gourmet kitchen. Located in the Farms, 24-hr guard gated community with five-star Rancho Valencia Resort & Spa a stoneâ&#x20AC;&#x2122;s throw away. Enjoy sunsets & hot air balloons floating overhead. % addresses of Olde Del Mar. $1,315,000 | 4 Bedrooms + 2 Optional | 4.5 Baths Desirable La Costa Oaks property situated on a panoramic VIEW LOT! Bonus room & downstairs guest suite! $849,000 | 4 Bedrooms | 2.5 Baths Beautifully upgraded property sitting on one of the largest lots on a cul-de-sac in highly desirable Rancho Carillo! Amazing Avocado Grove & Incredible Views 15245 Highland Valley Road, South Escondido I $1,695,000 - $1,895,000 Incredible opportunity to own & live on a profitable, privately gated 44 acre avocado grove in a fabulous South Escondido location! Enjoy panoramic views from the single level 2,548 esf 3 bedroom, 3 bath adobe home built by Weir Brothers featuring a great room with beautiful arched windows, a gorgeous stone fireplace and a wonderful open floor plan. Enter the property through private gates and explore the lush avocado groves on paved roads throughout the meticulously kept property that also includes a private reservoir with a well, a workshop with a garage and half bath plus groundskeeper housing. The home sits at the top of the property with its own private gate where the possibilities are endless and the views are too! Gorgeous 2014 custom estate in the coveted Wooded Area of Point Loma. 5BDs all en suite. Spectacular finishes throughout the 5,407 esf. Beautiful distressed, wire brushed, wide plank wood flooring. Custom cabinetry, open chefâ&#x20AC;&#x2122;s dream kitchen flows seamlessly into the family room featuring expansive sliding glass doors to the backyard pool and BBQ dining area. Game room, bar area and cozy covered patio and fireplace. Extra large 2+ car garage with front and side roll up doors. Ideal location -both beach and city close. Living the dream! Carmel Valley I $825,000 Fabulous END/CORNER unit! MORE windows than an interior unit. This particular town home is in the perfect location. Close to everything but away from freeway, school and construction noise! WALK to Schools, Shopping & Dining. Enjoy the calm. Resort style community featuring Pool, Gym, Tennis Courts, Playgrounds, Rec Room all beautifully landscaped and maintained. The best of the best! Come and enjoy the So. Cal Lifestyle. Priced better than new construction & with better amenities. In Escrow La Mesa I $325,000 Upgraded, Bright & Beautiful! Fully remodeled and move in ready. You are going to love how this space flows! HGTV would love this condo! 2 bedrooms/2 baths, open floor plan. 1 car garage with extra 1 car parking space. Stainless appliances, quartz counter tops, patio, walk in closets and tons of storage. Community pool. Fabulous neighborhood close to everything. Savor The Surf And Sand 824 Neptune I Encinitas I $8,800,000 Rare new construction plus fully engineered upper & lower seawalls, only 7 houses to Beacons beach access. Savor the surf and sand from the 2000 sq.ft. ocean terrace or the private balcony off the luxurious master. Frameless glass doors leading out to the terrace allow for easy indoor/outdoor living from this 5BD, 5 Â˝ BA 3 story home that lives like a single story, no steps into the house, using the elevator for complete access. Luxurious appointments abound with glowing Quartzite kitchen counter and sweeping 3 story circular stairwell enveloping a 24â&#x20AC;&#x2122; crystal chandelier. The best of nature (limestone floors) and technology (full automaton Crestron System) have been thoughtfully entwined. For the car aficionado, the gated driveway leads to a 2 car garage that expands to 3 with a car lift system. No detail has been overlooked! ©2018, NRT Incorporated. An Equal Opportunity Company. Equal Housing Opportunity. Coldwell Banker Residential Brokerage. Owned and operated by NRT, LLC. THE BRIDGES RANCHO SANTA FE | $2,549,000 A radical renovation has transformed this single level Cortile into a modern, bright, inviting, liveable space. Spacious and efficient, the floor plan includes 4bed/4.5 bath, executive office, climate controlled wine cellar, and spectacular â&#x20AC;&#x2DC;great roomâ&#x20AC;&#x2122;. Contemporary cabinetry, sleek countertops, and modern lighting enhance the architectural elements, and compliment rustic beams and tiles. The installation of solar panels and artificial turf means low, low maintenance. Sited on 1 acre, privacy and quiet are ensured. 			car garage. Enjoy sunsets from the west facing shaded terrace overlooking pool/waterfall and large grassy area. Kitchen. Personal Orange Grove, Private, Gated. Ultimate Southern California lifestyle....close to all that Rancho has to offer, schools, dining in the Village, Golf, minutes to the Del Mar Race Track and beaches. ERIC IANTORNO & ASSOCIATES 858.256.7005 | eric@ericiantorno.com DRE 01256501 Sotheby’s International Realty® is a registered trademark licensed to Sotheby’s International Realty Affiliates LLC. Each Office Is Independently Owned and Operated. DRE #01767484.